Dom Cobb is the best there is at extraction: stealing valuable secrets inside the subconscious during the mind’s vulnerable dream state. Back in 1999, director Christopher Nolan made a critical splash via Memento. However, real commercial success eluded him until 2005’s Batman Begins, and 2008’s Dark Knight led him to the edge of “A”-list status. But could Nolan direct a hit that didn’t feature a certain winged vigilante? With 2010’s Inception, the answer came back as a resounding “yes”. Critics adored the flick, and audiences attended it to the tune of $291 million in the US. The film sets up the concept that individuals can enter the dreams of others and steal ideas from them. This becomes a form of super-high-tech corporate espionage, as businesses attempt to lift notions from competitors. That’s called “extraction”, and Dom Cobb (Leonardo DiCaprio) excels at it. However, a botched job leaves him in need of redemption, so he accepts an offer to perform an “inception”. That requires him and his team to enter a dream and implant an idea. This is much trickier than extraction, and we follow the complex operation along with a mix of side complications, most of which connect to Cobb’s wife Mal (Marion Cotillard) and their unusual relationship. Look up “quick and dirty synopsis” in the dictionary and you’ll find the preceding text. Inception comes with a story so complex that my summary doesn’t remotely tell the whole tale. Perhaps too complex a tale, to be honest. At its heart, Inception comes with a pretty simple plot, as it’s essentially a caper flick: Cobb and his pals need to break into the mind of Robert Fischer (Cillian Murphy) and do their job. Cobb’s issues with Mal do add subtext to the proceedings, but the movie remains fairly basic when we get past its fantastic trappings. Of course, those fantastic trappings remain the main draw, as they turn the tale into something unusual. I have to give Nolan and company credit for something decidedly different here. Most summer fare involves sequels or remakes, so the presence of an expensive, complex effort like Inception amongst all its competitors makes it an effort to admire. But is it also something to enjoy? Yeah, though not as much as I’d like. When I saw Inception theatrically, I’d heard all the praise heaped upon it and expected something amazing. After all, I loved both of Nolan’s prior Batman movies, so I hoped to get a truly dazzling experience with Inception. Instead, I found something… pretty good. Not amazing, not stunning, but just pretty good. However, I thought a) the complexity of the movie might make it an experience that needed to be viewed again to really appreciate, and b) my high expectations would be more realistic on second screening. But nothing changed with my follow-up examination of Inception. Indeed, without the newness to keep me off-balance, the movie packed less of a punch. Initially I feared the dense nature of the plot kept me from being able to take in everything the film had to offer. Instead, I now think the complexity tends to make the flick look deeper than it probably is. Not that I think Inception fails to delve into interesting concepts about fantasy versus reality - I just don’t believe most of these go much of anywhere. Many of the characters come across more like plot devices than anything else, and the film tends to take itself far too seriously. This means moments of levity become few and far between. Granted, comedy doesn’t seem to be Nolan’s forte, and I don’t think movies need to be laugh riots to succeed, so I don’t mind that Inception lacks many funny moments. I just feel it might’ve worked better if it’d tried harder to have fun with its notions and not been so darned somber, as there’s no sense of playfulness or a nod toward the insanity of the concept. Normally I would appreciate that, but in this case, I think a lighter hand would’ve added some much needed verve to the proceedings. I don’t want to sound too down on Inception, as it does offer much to admire. Nolan certainly knows his way around an action scene, as the flick boasts a good number of effective sequences in that domain. Again, I do really admire the film’s ambition as well, for it shoots far beyond the usual megabudget summer movie’s parameters. But I can’t lie and pretend that Inception entertains me as much as I hope it would. The movie provides a number of strengths but these get buried under some of its pretensions. This leaves it as a good flick but not one that deserves claims of greatness. Inception appears in an aspect ratio of approximately 2.40:1 on this 4K UHD Disc. This turned into an excellent image. Virtually no softness materialized here. This meant a consistently tight, well-defined film, with lots of detail on display. As expected, I noticed no signs of jagged edges or moiré effects. Edge haloes and artifacts also remained absent, and I detected no print flaws. Colors went with stylized tones that emphasized orange and teal. While these choices lacked imagination, they came across well. Blacks were deep and dark, and low-light shots displayed solid clarity and delineation. Everything about the presentation satisfied. 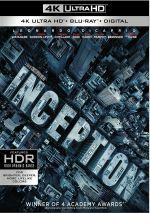 More praise fell upon the DTS-HD MA 5.1 soundtrack of Inception. Gunfire, explosions, car chases – all of the elements that can make a mix exciting popped up here. The movie didn’t boast constant sonic involvement, but it came fairly close, as much of the movie threw out action material. The track created a terrific soundscape in which these components moved around us in a satisfying way. That meant dynamic use of the surrounds. These were fairly equal partners in the proceedings, especially during those many action sequences. At those times, we got a lot of elements in the rear, and these contributed good life to events. Audio quality satisfied. Speech appeared concise and distinctive, without edginess or other issues. Music boasted nice vivacity and life, while effects demonstrated excellent clarity. Those components appeared dynamic and precise, with good range and punch. The soundtrack of Inception delivered what we’d like from a movie of this sort. 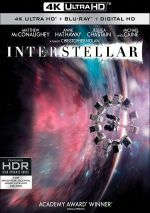 How does the 4K UHD compare to the Blu-ray version? Audio remains identical, as both discs use the same DTS-HD MA 5.1 soundtrack. As for visuals, they demonstrated the usual improvements I expect from 4K UHD. Sharpness appeared tighter and more precise, while colors offered more pop and blacks seemed richer. We got a nice step up in picture quality here. No extras appear on the 4K UHD disc itself, but the set comes with a Blu-ray Copy of Inception. On Blu-ray One, we find a picture-in-picture feature titled Extraction Mode, and you can access it in two different ways. You can watch it as it accompanies the film, or you can “jump right to the action” and access its 14 clips individually. “Jump” also comes with a “Play All” option that fills 44 minutes, 13 seconds. This seems like the most sensible choice, as it presents the snippets in a larger format, and it avoids the 100-plus minutes during which we see no extras. Across the 14 “Extraction Mode” pieces, we hear from writer/director Christopher Nolan, producers Jordan Goldberg and Emma Thomas, production designer Guy Hendrix Dyas, special effects supervisor Chris Corbould, stunt coordinator Tom Struthers, visual effects supervisor Paul Franklin, editor Lee Smith, director of photography Wally Pfister, picture car coordinator Tyler Gaisford, first AD Nilo Otero, composer Hans Zimmer, and actors Leonardo DiCaprio and Joseph Gordon-Levitt. The featurettes cover the movie’s origins and development, various themes and concepts, locations and sets, stunts and various effects, cinematography and editing, music and a few other areas. Most of the material sticks with technical topics, which is a bit of a disappointment. 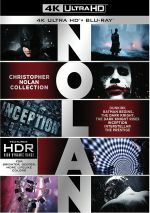 While I’m sure Nolan would prefer to let viewers interpret the film on their own, it still would’ve been nice to hear him discuss characters and themes in greater detail. Still, we find a nice overview of the different elements related to creating the flick, so “Extraction Mode” is worth your time. Over on Blu-ray Two, we open with a documentary called Dreams: Cinema of the Subconscious World. It goes for 44 minutes, 29 seconds and includes notes from Nolan, Gordon-Levitt, DiCaprio, Stanford University Professor of Behavioral Sciences and Sleep Medicine Dr. William C. Dement, Grant MacEwan University Dr. Jayne Gackenbach, Harvard Medical School’s Dr. Deirdre Barrett, UC Santa Cruz Research Professor in Psychology and Sociology Dr. G. William Domhoff, Lucidity Institute founder Stephen LaBerge, and psychiatrist/Second Sight author Dr. Judith Orloff. We also get a few “ordinary folks” who discuss their dreams; this list features Kali Bernard, James Brown, III, Maria D. Hernandez, Bronson Page, Lynarion Hubbard, Saqi Syed and Alexandra Broudy. “Cinema” provides a few notes about Inception, but it mostly focuses on the nature of dreams. That makes it moderately educational, but it’s a little on the scattershot side. While we learn a decent amount about dreams, the program doesn’t become as substantial as it could. Inception: The Cobol Job offers an “animated prologue”. It goes for 14 minutes, 33 seconds, as it delivers a semi-animated comic book experience. As the title describes, it shows us the gig that led up to some of the movie’s events. It helps flesh out our understanding a bit better, so it’s a fun addition. Fans of movie music will enjoy the 5.1 Inception Soundtrack. This offers exactly what it indicates: the film’s score presented in DTS-HD MA 5.1 audio. All together, the cues run 38 minutes, 38 seconds. Next we get some stills. The disc includes a Conceptual Art Gallery (33 stills) and a Promotional Art Archive (12). The former provides material created to set up the film’s visuals, while the latter sticks with posters. Both are good, though I dislike the dopey choice the set each image at an angle. I guess this is supposed to offer a clever evocation of the movie’s skewed viewpoint, but it’s just annoying. Finally, Blu-ray Two boasts some ads. We get three trailers (one teaser, two theatrical) and 13 TV Spots. While Inception does provide some good action and stands out as something unusual, it doesn’t quite coalesce into a genuinely satisfying experience. The 4K UHD offers excellent picture and audio as well as a moderately informative set of supplements. This turns into a high-quality release for an erratic but intriguing movie.